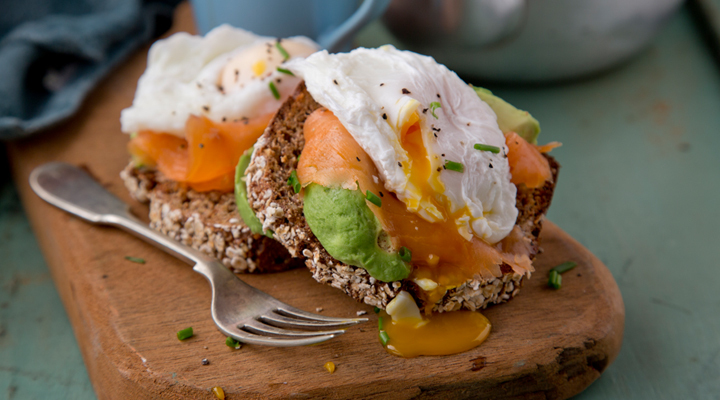 Tucking in to some nicely poached eggs with avocado and smoked salmon is an ideal treat at lunch time. 1. Bring a small pot of water up to a steady simmer. Crack the eggs into two separate cups or ramekins. Add a splash of white wine vinegar to the pot and stir the water to create a whirlpool in the centre, then slide in one of the eggs. Poach the egg in the simmering water for 3 to 4 minutes, then remove with a slotted spoon and drain on a plate lined with kitchen paper. Repeat for the second egg. 2. Place the avocado and smoked salmon on the toast and add a squeeze of lemon juice. Top with the poached eggs and a pinch of salt and pepper and serve straight away.